Award preceeded Oscars success for "American Beauty" and "Slumdog Millionaire"
Designer Tom Ford's directorial debut "A Single Man" bought by Weinstein Co.
TORONTO, Canada (CNN) -- This year's Toronto International Film Festival wrapped up Saturday and Hollywood evacuated, leaving the city to turn its attention to ice hockey team, the Maple Leafs' fall calendar. Director Lee Daniel's' "Precious: Based on the Novel by Push," took home the all-important Cadillac People's Choice Award for Best Film. The award, voted by festival audiences, is considered significant because it has led to Oscars success for past winners, notably Sam Mendes' "American Beauty" in 2000 and last year's sleeper hit "Slumdog Millionaire." The accolade is by no means a guarantee of Academy Awards , however, particularly for a film like "Precious" that does not try to dress up its bleak message for audiences. At the very least, the award will guarantee "Precious" substantial distribution, as well as exposure for two-time director Daniels. Producer and American TV talk show icon Oprah Winfrey will also gain exposure, although she probably needs it less. "Precious" was by no means a shoo-in for this kind of acclaim: Although executive produced by daytime TV darling Oprah Winfrey, its biggest star is Mariah Carey, whose previous performance in "Glitter" got a resounding critical smackdown. 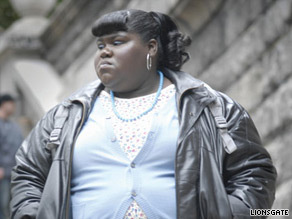 Even Mo'nique, whose poignant performance has captivated critics since the film's first showing at Sundance Film Festival in January, mainly had roles in lesser-known TV sitcoms before "Precious." The film has wowed pundits through all the year's major festivals and generated an outpouring of emotion from audiences for its depiction of a teenage abuse victim struggling to survive in 1980s Harlem. Daniels himself attempted to explain the spirit of the film at the awards ceremony Saturday: "I made this film for every person out there who ever looked in the mirror and felt unsure about the person looking back," he said. The Cadillac People's Choice Award -- Documentary went to Leanne Pooley's "The Topp Twins: Untouchable Girls." The film follows a lesbian country and western band from New Zealand as they tour the U.S. and Australia to a rapturous reception. While Michael Moore's controversial and much-publicized look at what caused the 2008 financial crisis took second place. French drama "Hadewijch" directed by Bruno Dumont in which a girl's obsession with Jesus leads her to terrorism bagged the FIPRESCI (International Federation of Film Critics) prize, and Rubba Nada's "Cairo Time" starring critics' darling Patricia Clarkson won Best Canadian Feature. The days of studios fighting over distribution rights to indie films and treating festivals like feverish shopping sprees have been thoroughly doused by the faltering economy. "The days of the bidding wars are over to a certain extent," festival director Piers Handling told industry mag Hollywood Reporter. "[But] this doesn't speak to the quality of films as much as where the market is." But several films did get lucky. Fashion designer Tom Ford's directorial debut "A Single Man" impressed audiences and was bought by The Weinstein Company. Star Colin Firth was named Best Actor earlier this month at Venice Film Festival for his turn as a recently bereaved professor in 1960s LA. "Defendor," a comic-book inspired feature starring ever-watchable Woody Harrelson as a mentally-challenged vigilante convinced he has super powers, was also picked up by Sony Pictures Worldwide. With fewer deals being done and less money on the table, even for films packing A-list stars -- many Toronto offerings will have to wait until after the festival to secure distribution deals. Indeed, some features with awards season hopes pinned on their festival performance will now have to focus on simply getting into movie theaters.